Few people have visited Antarctica, and even fewer have skied there. On Nov. 23, 2009, 10 skiers, filmmakers, writers, photographers and sailors left Argentina on a journey to ski the Antarctic Peninsula. The result was a documentary film, "Australis: An Antarctic Ski Odyssey" and the experience of a lifetime for Chris Davenport and crew. "It was an incredible and amazing part of the world that very few people have seen," Davenport said. "I've traveled around the world for the last 15 years, and I pride myself on knowing where great places are. I had no idea. If I don't know, other people certainly won't know." The dream project of professional big-mountain skier Chris Davenport, the documentary film "Australis: An Antarctic Ski Odyssey" covers a sailboat trip and ground exploits of the brave travelers, who make descents down lines never skied before. "I love finding and going to places where people haven't skied," Davenport said. "There was lots of logistically planning to do. It was a big part of the trip." Davenport said the weather on the journey was amazing, which is not usually the case. "There have only been a handful of ski expeditions down there—maybe five or six," he said. "I read about the trips and knew what to ski." Davenport said trips to Antarctica are well documented, and he talked to many people who had been there and learned what to expect. "We didn't have a script," he said. "I wanted to tell a good story and it was hard to script because of snow and weather. I let the story write itself, and it worked out well." The film is not just ski action. Davenport said he wanted this film to be different. "The film is about the place and Mother Nature," he said. "We're just secondary." ( 6:30 p.m. at the Sun Valley Opera House, $10. Tickets available at the door. ( 8 p.m. at Whiskey Jacques' in Ketchum, $10. Tickets available at the door. Proceeds to benefit the Sawtooth Avalanche Center. 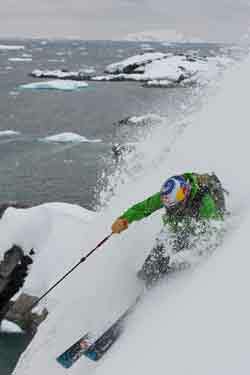 Davenport will also have a book signing for his recently published book "Fifty Classic Ski Descents of North America."